Grand Canyon University Honors Institute students focused their projects for this year’s Spring Symposium on three essential University themes: ethics, service and leadership. One group developed a Habitat for Humanity presentation to explore what has made that relationship fruitful so far and how it could be strengthened as GCU continues providing volunteer leadership to help fuel renovations to as many as 700 homes in its west Phoenix neighborhood Other projects include those linking business and health care with community service. 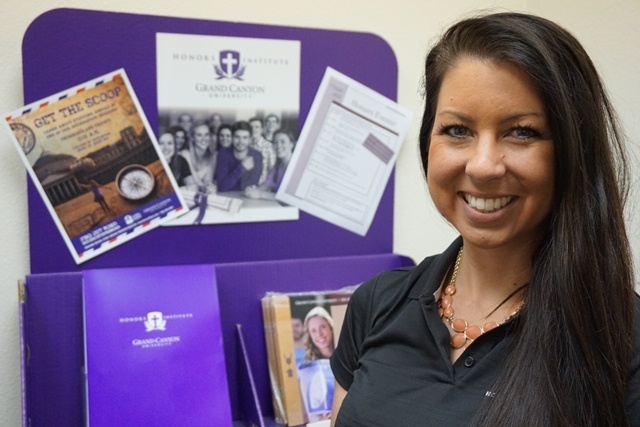 Breanna Boling said GCU’s Honors Institute, which hosts its Spring Symposium on Saturday, could grow to more than 600 students by the fall. The second annual symposium marks a turning point in the development of the Honors Institute, which increased its membership from 60 students to nearly 300 this school year. Presentations are scheduled for 11 a.m.-12:15 p.m. Saturday in the Antelope Gym lecture halls and first floor of the Student Union. Honors membership is expected to double to more than 600 during the 2015-16 year, based on the hundreds of incoming freshmen and transfer students who already have committed, said Breanna Boling, who oversees the Honors Institute. She added that the Honors Institute’s focus is to provide real-world, hands-on experiences to students, offering them an outlet to couple academic study with community engagement. Many Honors Institute students are double majors or have two or three minors, so the program also aims to provide access to interdisciplinary speakers and career development opportunities, Boling said. This augments the resources GCU students receive through their individual colleges and Career Services. Honors students’ Spring Symposium projects reflect their individual career interests or passions. For example, nursing and biology students have explored how to bridge their classroom skills through mobile clinics or similar efforts and bring wellness education to people in the community. Many of the Honors Institute juniors attended a leadership retreat in February and plan to reflect on that experience in their symposium presentations, Boling said. To be admitted to GCU’s Honors Institute, incoming freshmen must have high school GPAs of 3.8 or higher and ACT composite scores of 27 or higher or combined scores of 1200 on the math and verbal SAT tests. Transfer students must have a 3.5 GPA or better, and all students must maintain a 3.5 GPA to remain in the program. Applying students are encouraged to demonstrate their commitment to academics, servant leadership and community involvement. Many students are drawn to the Honors Institute’s extracurricular opportunities through faculty mentors, exclusive academic events and career-development activities. Vince Indelicato, a 20-year-old sophomore in the Colangelo College of Business, and other Honors Institute scholars will present to GCU executives in April a proposal for expanded Habitat efforts. The group, which included 17 sophomores and two freshmen, was asked by University leaders for ideas on developing a more holistic relationship with Habitat to fully tap the University’s vast resources in health care, theology, technology and other academic areas. “Our plan was just to create a sustainable, workable model that will not only make a change here but also serve as an example for other parts of the country,” said Indelicato, who is majoring in business intelligence. For example, a future GCU-Habitat effort might include students volunteering with families after the construction on their homes is completed to help them with wellness or financial security needs.